I’ve also been hearing pretty amazing things about dates. It seems these succulant jewels are power packed with goodness for pregnant women. A study published in the Journal of Obstetrics and Gynaecology concluded that eating 6 dates daily during the last 4 weeks of pregnancy “significantly reduced the need for induction and augmentation of labour, and produced a more favourable, but non significant, delivery outcome” this is one of those incredible moments where old wisdom meets new scientific research. I’ve never been that keen on tucking into dates in their natural state. I’ve really tried over the years, especially when I’ve had to go cold turkey on chocolate. They seem like an obvious choice. 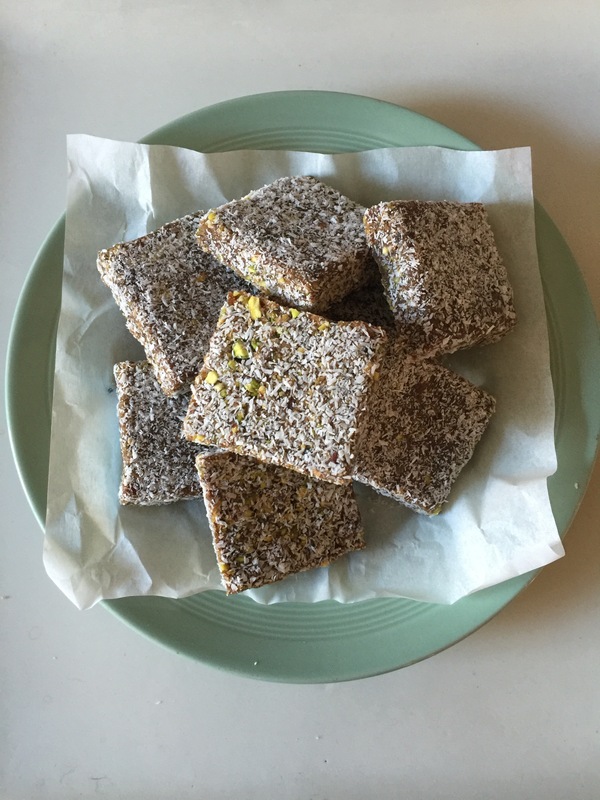 Whether it is the Sticky and fudge like medgool dates, or the hard and toffee like regular dates you get in boxes at Christmas time, there is something about the texture of them which I’ve always struggled with. I think it is also their cloying sweetness I dislike. However when they are used as an ingredient to add sweetness and richness in baking or blended with nuts to make sweet treats it’s a different matter! While I was pondering this idea of making dates more palatable for us, inspiration came from an unlikely place. As I wandered through our weekly food market in Axminster I spotted amongst the bread and pastries on the local bread stall, a raw date and pistachio slice. It hit the delicious spot and was so good! When I got home did a bit more research and came across an almost identical recipe from The Guardian by tom Hunt of toms feast.com. 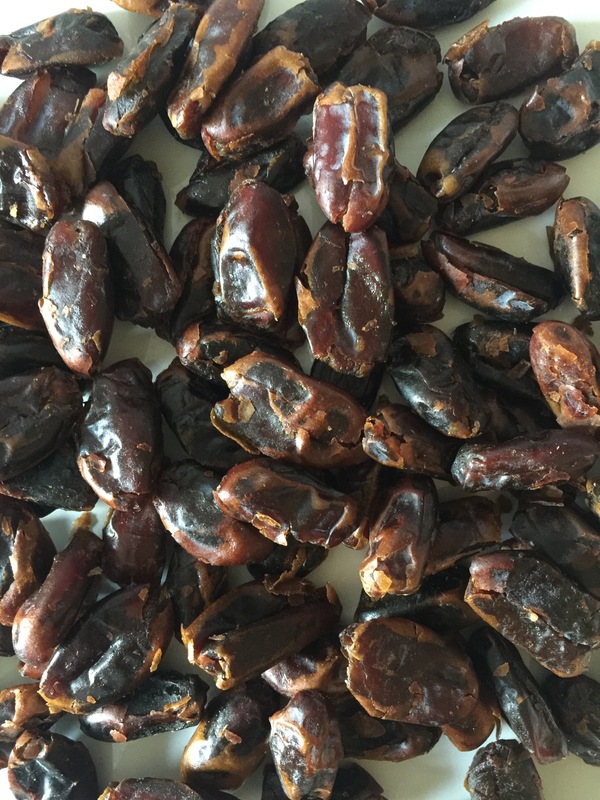 I experimented with different kinds of dates and found the harder dates gave a chewier and more toffee like bar which I prefered but if you wanted a softer texture then use medgool dates. I also switched out the oats for ground almond which is better for my celiac husband. But you could use oats which are cheaper and also have a lovely flavour. Dates are incredibly nutritious, full of fibre and packed with vitamins and minerals. Pregnant women are advised to eat 6 dates in the last month of pregnancy. Researchers have found that dates have an oxytocin-like effect on the body which has led to some amazing claims. Women who eat dates are said to have a shorter first phase of labour, and it can help with cervical dilation. They are also more likely to have intact membranes on admission to hospital and go into spontaneous labour, thereby avoiding pitocin, the synthetic hormone used to induce labour (ouch!). The oxytocin effect leads to an increased sensitivity of the uterus which stimulates uterine contractions which to helps to cut down on post partum haemorrhaging. As well as containing a lot of fibre dates are high in vitamins and minerals . One of these is Potassium which is a natural electrolyte and can help balance the water/salt ratio keeping blood sugar levels regulated. The combination of high fibre and potassium can get the bowels moving which in turn will often trigger contractions. Vitamin K and Folate both benefit the baby. Folate ensuring the babies spine matures properly and Vitamin K maintains blood clotting and bone health. Although the study was very small it has had a lot of interest and historically, eating dates to help women with pregnancy and labour is mentioned in both the bible and the Koran. Proving its not just science it’s also an old wives tale! In any case it’s one of those moments where it can’t hurt to try and the reward of a shorter labour with less intervention has got to be worth it. Blitz the dates in the food processor until they have formed a rough paste. 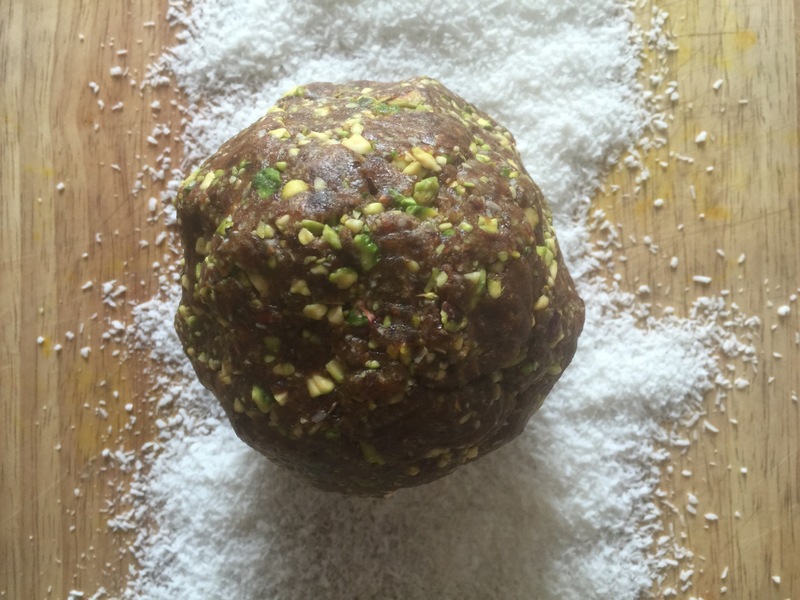 Add in the raw pistachios, ground almonds or oats, honey, water and the dessicated coconut. Process again until well mixed and it has all of blended together. 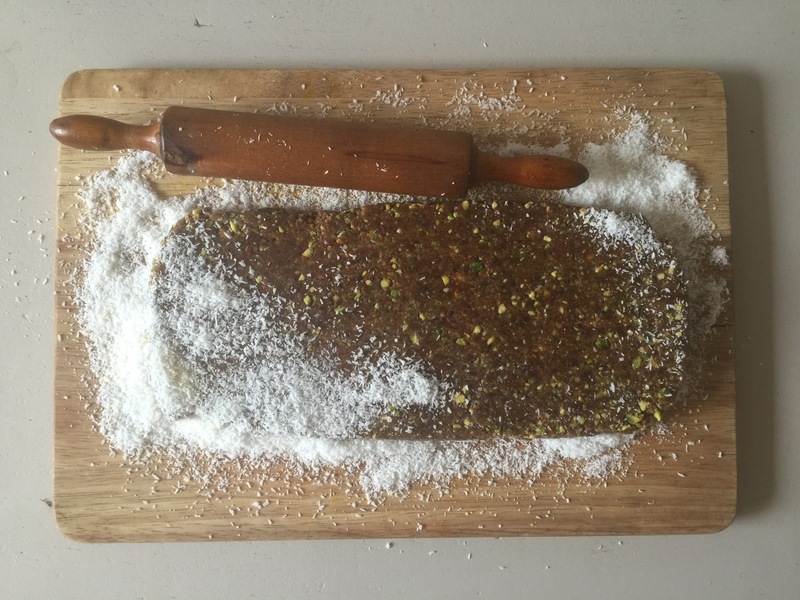 Once blended tip on to your work surface and roll it into a rectangle about 1-2 cm thick. Cut the rectangle into bars. Roll the bars in dessicated coconut until evenly coated. These bars can be kept in an airtight container for up to a month. This entry was posted in alkaline, Gluten Free, kids, raw, Recipes and tagged dates, due dates, pregnancy, raw, study. Bookmark the permalink.